Quality leads are the key to online marketing success, and a system for classifying those leads in order to improve your marketing process is critical. Without tracking the details about your leads, you can’t connect your marketing efforts back to your actual revenue. This is why DSS provides an integrated solution for classifying all of your leads to see which kinds of leads are turning into cases or patients and where they are coming from. How do I classify my leads in DSS? Leads & Reports > Leads by Date - This is where you normally view all of your web leads. Leads & Reports > Leads by Offer Forms - This is where you can view leads specifically by type of form filled out. Contacts > Edit Contact - This would be an individual contact in your CRM (non-CRM users don't have this option). Block this Email : This icon will block the email address of the lead so they cannot contact you through your website again. Delete this Lead : Removes the lead from your lead report entirely (this should only be used to remove leads generated through testing or internal procedures; even if a lead is bad you should still track it). Edit this Contact: Though it does not have its own icon, you can easily jump to an individual contact record by clicking on his or her name. Lead Type: The list of "lead types" is automatically generated based on your website's service areas. Score: 1-5 star rating system with 1 being the lowest and 5 being the highest so you can score each lead based on how good it was. Typically a 1 would denote a spam lead or something totally unrelated, and a 5 would be used for leads that turned into a case or patient. Source: This categorizes where the lead came from - the options include Internet, Past Client Referral, Friend/Family Referral, Direct Mail, Phone Book, TV, Print Ad, Radio, Billboard, Returning Client, and Other. Action: This is the action taken by you after the lead was contacted, e.g. the case or patient was taken, referred out, denied, just a general lead, pending more information, or maybe it was just spam. Action Date: This field should be filled out with the date you were in contact with the lead. Action Note: Anything goes! 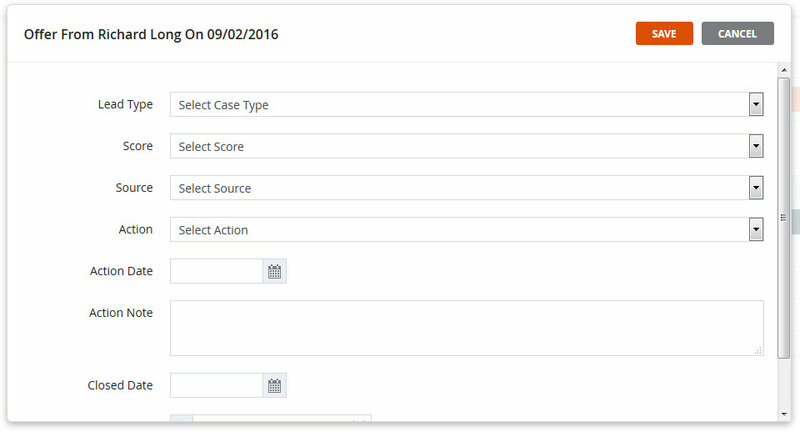 Any information related to classifying your lead that isn’t captured in the other fields can be added here. Closed Date: This is when the case was officially closed. Value: This is the monetary value to your company of this particular lead. You now have all the tools to classify your leads and run reports to see where all of your quality leads are from and how much revenue they are bringing in. If you need help with this feature in DSS, don't hesitate to call 888-886-0939 to talk to our helpful customer service team.